I Love You More Than Carrots: Birth Announcements + $100 Custom Stationery Giveaway! 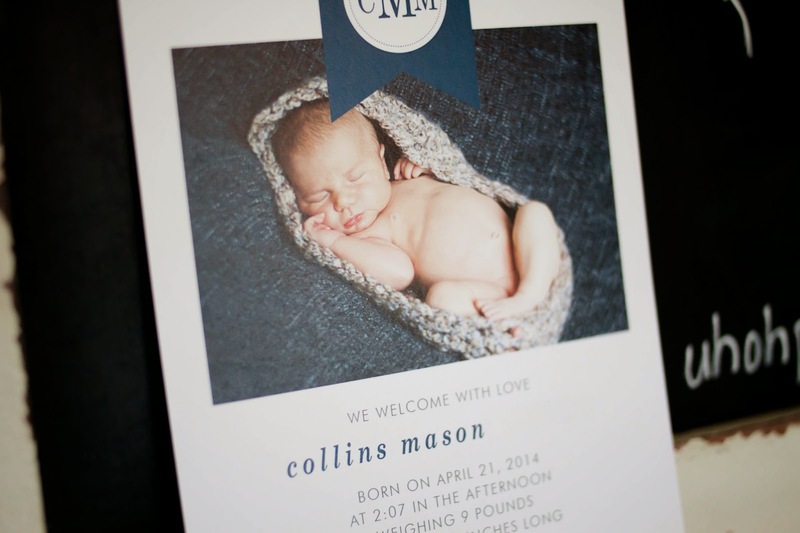 Birth Announcements + $100 Custom Stationery Giveaway! I'm a relatively brand loyal consumer. That is to say that once I find a brand I love, you can bet I stick with it for years to come. This applies to many facets of my life, especially custom stationery, prints and, specifically birth announcements. In previous years I've always used one of the "big box" paper retailers and have always been highly satisfied. 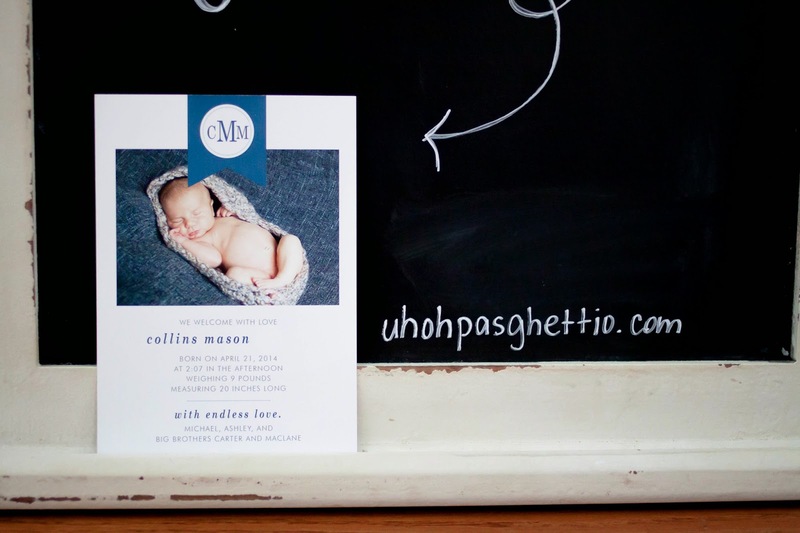 That said, when Kim, brand new mom and mompreneur behind uh oh pasghettio reached out to me and offered to create custom birth announcements for Collins, I decided to give her shop a try and I'm so, so glad that I did. After perusing her website, I was immediately impressed with her wall art designs, stationery and custom design work. She is also pretty awesome and an absolute blast to work with. After much thought, I was able to narrow down my print selection to three favorites and, believe me, it wasn't easy. As for the final decision, Kim and her team were able to help me select the best print for the photo that I had chosen to use on the announcement. When it came time for final drafts, Kim and her team sent over a few different layouts to make sure I was 110% satisfied with the finished product. Kim has kindly offered one reader of ILYMTC the Blog a $100 gift certificate to uh oh pasghettio to be used on whatever custom paperie their heart desires. From birthday invitations to shower invitations, custom prints and graphics and beyond, I guarantee you'll find something to love on her site. Entry is easy. Open to US residents only. No purchase necessary to enter. Good luck! Aw, I love Kimmie and Uh Oh Pasghettio! I love the birthday invitations. My littlest one will be ONE soon so I would love to win this so I could have some special invitations for his big day :) Oh what fun, Barrett is ONE!! So cute! I would love to try their products out! I've always wanted a print like "home is where the heart is". So cute! Any one of these announcements would be the perfect way to announce our new bundle of joy set to arrive on New Year's Eve! They are all adorable!! I especially love the raining onesie shower announcement! Would love to win this for our future baby announcement or Christmas card!!! Love the Big Fat Raindrops - so cute! I'm leaning towards the zachary or the samuel! I would love to get the lyndsay for my daughter due in Aug.
My daughters first birthday is coming up in a little over a month and I would love to get some invitations from this fabulous shop! Awesome giveaway! I would love to get nursery prints for my babes' walls! I like the alphabet prints! We are expecting baby #1 any day now, and I would love to get some birth announcements! I don't have a fam yet, but I love her wall art prints and graphics! Totally fuel to the redecorating fire! What cute stuff and I love the name of her company. Too cute! Thanks for introducing me to this cute stationary. I would love the You are my sunshine, Family Rules, Cityscape or Being a Brother print! Still working on the nursery for baby boy #3 too!! I love celebrate with glitter! I would love to use these for the new baby's birth announcements! I love the Lilian and the Hollis! love them all... would have a hard time choosing! These would be perfect for baby #2's birth announcements! Love the prints so much, especially bouquet of flowers. I am expecting a baby girl in October and I would choose the lillian or the katelin birth announcement! Love "The Edward" birth announcement. Matches my soon to be baby girl's room! Love the Ryan announcement! So precious! Collins' announcements are absolutely gorgeous, too! I love the cody birth announcement- so sweet!! I like the Oh What Fun! birthday party announcements. thanks for the chance. cute site. So beautiful! I would love these! Dog stole our heart print!! LOVE it. Ad the butterfly letter one. :) So cute. I love the abc name print! Love the abc name print! Love the family rules and so many more! Oh I love the dainty flowers alphabet print and the trucks alphabet print. So so cute! I love the rules of the playroom print! Cindy B (on rc/fb) I am having a hard time choosing but I really like the Evan. Would love to use the site for my new baby's birth announcements! I would pick one of the alphabet prints for my daughter's room and the love you still print for my upstairs gallery wall! They are all wonderful, I do really like the Mason! I love the caleb announcements! Truly love the designs that has been share through this article the concept has of these designs looks so cool to eyes i would prefer to print these designs i would like to give graceful thank you to author for sharing fabulous announcement with design lovers.